Famous For: First European to travel inland in North America. Claimed Canada for France. 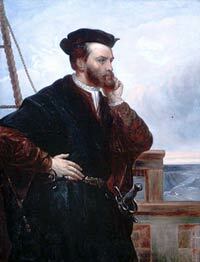 Jacques Cartier was born on December 31st, 1491 in Saint-Malo, Brittany. During his childhood he heard the stories of Christopher Columbus, and he was inspired by them. So, throughout his life Cartier learned about navigation and eventually became a skilled mariner. He wanted to change the way things were in France, but he could not do so because he did not have the proper political standing. Fortunately, this changed when he married the daughter of a powerful political family, Mary Catherine des Granches. Cartier took three voyages during his life and accomplished quite a bit during them. The first voyage was on April 20th, 1534 and was commissioned by the king. The goal of the voyage was for Cartier to find a western passage that would allow easier access to certain spots in Asia. During this voyage Cartier made many stops and encountered many different types of people. Eventually Cartier took control of Gaspe Bay. Here the inhabitants allowed this only because he provided them with goods to trade from Europe. Cartier returned home in 1534 and then started making plans for his next voyage. On May 19th, 1535 Cartier went on his next voyage with a crew of 110 men and 2 captives he took from his first voyage. His first stop was in Sainte-Marie Sault, where he felt he found the Northwest Passage. From here Cartier went to Stadacona, where he and his crew spent the winter. Unfortunately the rough weather conditions caused scurvy to break out, but Cartier was able to use an Iroquoian treatment to help save his crew’s lives. In May of 1536 he traveled back to France with his crew and Chief Donnacona. The third voyage took place on October 17th, 1540, but a friend of the king actually was commissioned to lead the expedition. Cartier sailed ahead of Roberval, the king’s friend, while he was waiting for supplies. He was headed to find the Kingdom of Saguenay, where he was to establish a settlement along the river. He settled in an area that is now known as Cap-Rouge, Quebec. After settling here for a while, Cartier then went back on his mission to find Saguenay. Unfortunately bad weather prevented him from finding this area, and when he returned back to his settlement he found that things had quickly gone downhill. The Iroquoians weren’t trading and seemed to be upset at the settlers. During that winter it is believed that they killed some of the settlers. In June, 1542, Cartier went back to France and ended up staying there. Roberval took over the settled land that Cartier left, but it was abandoned due to disease breaking out and bad weather driving other people away. Cartier spent the rest of his life in his estate in Saint-Malo. He died on September 1st, 1557 from an unknown cause, although it’s believed to have been typhus. There are many monuments and landmarks dedicated to Cartier that can be seen in Canada today. These include: the Jacques Cartier River, the Jacques Cartier Monument and the Jacques Cartier State Park.